CRP's 2nd Annual Holiday Gift Guide | CREATIVE RETAIL PACKAGING, INC.
As the holiday season rolls around once again (or, rushes in with surprising speed, as it were), we at CRP are in a truly thankful mood. 2015 not only found us collaborating with some of the most wonderful clients imaginable, but it just so happens that these same clients are responsible for a bevy of gloriously giftable treasures - last-minute miracles for those of us with unchecked names remaining on our gift lists. In the spirit of giving (and, perhaps with a hint of pride in all that we’ve helped to create this year), we present you with our second annual CRP Holiday Gift Guide. There’s no finer wintertime gift than a warm, rugged, limited-edition blanket from Filson. Custom-made by Faribault Woolen Mill in Minneapolis, its striking design was inspired by Pacific Northwest native culture. Ideal for any rustic occasion, from fireside hot toddies to weekends at the deer lease. Score double the brownie points with the BVLGARI Omnia Gemstone Collection. Any of these prestigious scents is sure to leave a lasting impression, and your purchase also comes with a luxury jewelry travel box that’s grand in and of itself. Even a fantastic recipe can fall flat without the proper technique. With a Sur La Table cooking class, your giftee will learn vital cooking skills in a hands-on environment led by professional chef instructors. They’ll be slicing, dicing, blanching and fricasseeing in no time. This is no ordinary shirt; it is confidence with sleeves. 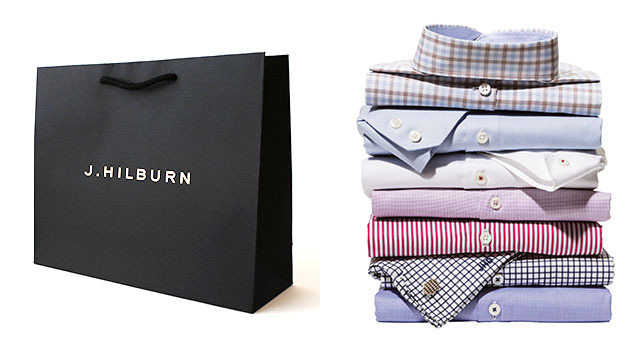 J.Hilburn partners with the world’s most prestigious mills to assure that his shirts fit like a glove. A dapper recipient will immediately appreciate the craftsmanship, but even a scruffy sibling will feel the boost that modern design, premium fabrics and perfect fit bestow. While a Hawaiian vacation is a bit pricey for gifting, a Hawaiian escape for the tastebuds is firmly within reach with Anahola Granola. Their fresh and local ingredients capture the exotic flavorings of Hawaii’s tropical splendors, taking you there without having to clear security. If they’re old enough to walk, they’re old enough to sail. Encourage the little future skipper in your life to embrace salty sea adventures with these adorable kid’s boat shoes from one of our favorite children’s brands, OshKosh B’gosh. While we’re still not exactly sure what a “malt-focused mash” is, the liquor connoisseur or old-soul mixologist on your gift list is sure to appreciate the many complex flavors in every bottle produced by Westland Distillery. They always honor tradition, while adding a modern touch to their spirits. Board-gaming is definitely back in vogue, and for the serious gamer on your list, this beautifully handcrafted Backgammon set with brass hardware and a leather handle is sure to impress. It’s an utterly classic game revamped with a thoroughly modern design. 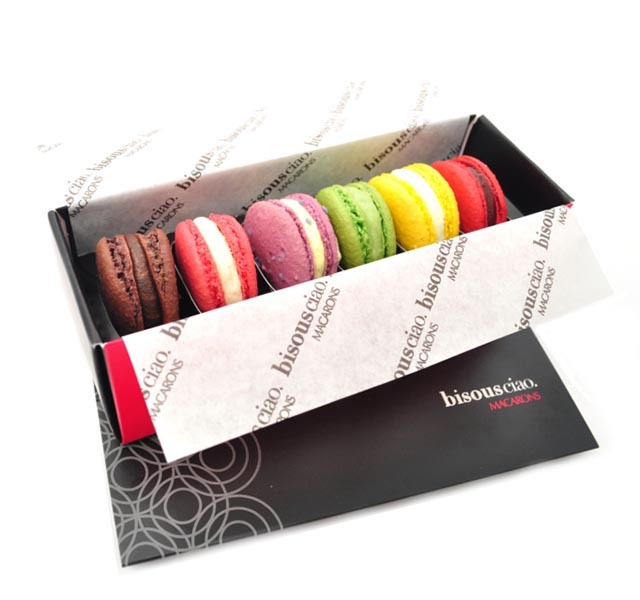 Give the notorious sweet tooth in your family a French treat that will make them say, “Oui oui!” Made with love in NYC, delicate Bisous Ciao Macarons boast unique blends of worldly flavors and perfumes. Best of all, you can pick and choose your own custom assortment, which is then wrapped in a lovely custom box. Who says that tea parties are only for little girls? 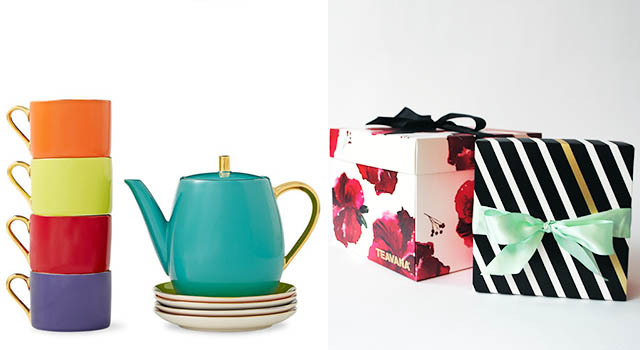 Get the proud tea-drinker in your life a vibrant multicolor teapot set from Teavana. Whether sipping oolong with friends or weathering a cold, this set will brighten even the gloomiest winter days. Throw in a box of one of Teavana’s unique blends, such as Ruby Spice Cider, and you have the perfect gift. “Timeless” may seem like an odd choice of words when describing a watch, but this robust, reliable and elegant Victorinox timepiece is certainly that. The quality, tradition and innovation of the Swiss Army company ensures that this gift will keep on giving - and ticking - for years to come. What does a shopaholic dream of most (besides an infinite shoe closet)? A personal stylist. Tootsies can make this dream come true by completing your loved one’s look in a way that fits their unique personal taste, with the help of an expert stylist. Complimentary gift-wrapping is an added perk that leaves even more time for shopping! You don’t have to move heaven and earth to achieve gift-giving nirvana. Reminiscent of the starry skies of a crisp winter night, Coach's Pave Stars necklace showcases a gorgeous cluster of mixed-metal stars with twinkling pavé accents.